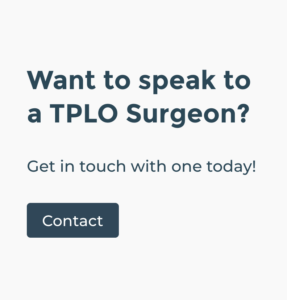 You’ve consulted with your surgical vet, and, after she’s explained the procedure in detail, you’ve determined that TPLO surgery is your dog’s best option. But what happens after your pet comes home and is undergoing TPLO recovery? 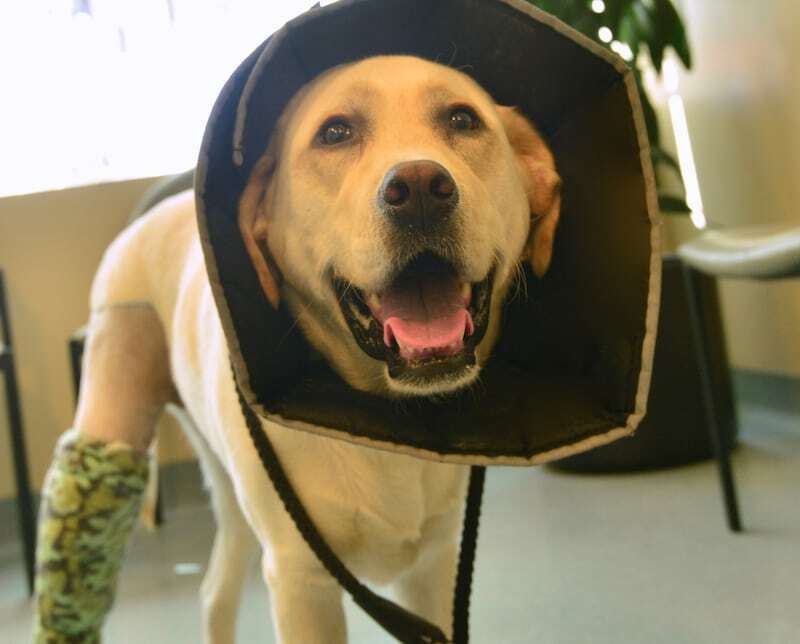 The TPLO procedure to repair a CCL—otherwise known as the canine ACL—is fairly straightforward as surgeries go, but as with all operations, the recovery period is essential to your pet’s best outcome. When you know what to expect in the days and weeks following your dog’s surgery, your dog should recuperate on a fairly predictable timeline. In fact, you’ll probably be surprised by how soon he’s back to the dog he was before his CCLR symptoms first appeared! As you know, during TPLO surgery part of your dog’s tibia is actually removed and repositioned to better support the femur to take stress off the ligaments. That bone graft is secured by a plate and screws, but it still needs to “knit” to become fully stable. In most cases, you’ll bring your dog home the same day as his surgery. He’s going to be sore and a little groggy. Your veterinarian will provide you with a care sheet, and she’ll either give you an anti-inflammatory pain medication or recommend an over-the-counter pain reliever. If your dog is a large breed, ask your vet for tips on how to safely carry or support him. Once you’re home, make sure your dog has a quiet place to rest, preferably on the margins of your home’s activity where he doesn’t feel isolated but won’t be disturbed. Use safety gates to restrict access to stairs and long “runways”, and keep exterior doors closed. During the first 4-5 days, apply an ice pack wrapped in a dish towel to the joint for 15 minutes at a time. Frozen peas work great, “molding” to the joint for best coverage. Cold treatment will help reduce swelling and discomfort. After 5 days, switch to a heat pack—no hotter than what’s comfortable on your own skin. Your dog’s digestive system might be a bit upset, so try feeding him small meals of cooked rice and chicken meat for the first 24 hours. Plan on helping your dog to get around and relieve himself for the first day or so, though it’s good to let him put a little weight on his healing joint as soon as he’s able. This actually helps recover muscle mass, range-of-motion, and bone density. Just don’t let him overdo it! Your dog will have to wear a special collar to prevent him from chewing his surgical site. Even so, keep an eye on the bandages to make sure they remain in place and follow your vet’s instructions for cleaning the wound site. Once the surgery drugs are out of his system, your pet’s going to want to get up and move around. Dogs tend to heal quickly, but they can also be good at hiding discomfort. Don’t let him trick you into thinking he’s “all better”! Too much activity too soon can set him back in his TPLO recovery. Keep checking the wound site, and never leave the special collar off your dog when he’s unsupervised. Licking and chewing the site can cause serious infection to both the skin and to the healing joint itself. You should be able to leave your dog unattended most of the day if your household members are at work or school, though someone will need to come in to let him out on-leash for potty breaks on his regular schedule. Dog doors should be kept locked to prevent unrestricted access to large spaces, and if your dog is crate trained, he will be less likely to have an accident. Though more than a couple hours in a small space will cause him to become stiff. By now, your dog is probably full of energy and moving better than he has in years. Don’t be tempted to push his limits just yet! After about the eighth week, your vet will most likely clear him for regular activity, but until then you’ll need to gradually increase the time you spend outside walking on the leash. By the seventh or eighth week, for example, you’ll be up to two 20-30 minute walks, with short “potty breaks” throughout the day. You might want to continue using heat treatments after his walks, or anytime he appears a little sore. During this period, you’ll visit your vet for a follow-up, and she’ll remove your dog’s stitches or staples. Be sure to follow her instructions for any further wound care or pain management. However, dogs usually don’t need pain medication after the first couple days. If your veterinary surgeon has prescribed or recommended pain or anti-inflammatory medication, follow her instructions to the letter. Dogs may show sensitivity to certain medications, just as we do, so don’t hesitate to check with your dog’s vet if you suspect a problem. Medications, change in activity, and the process of undergoing surgery and healing may cause your dog to become constipated. The recommended exercise routine doesn’t just help heal your dog’s CCL and knee joint, it also helps keep everything else in motion too. Don’t worry about clipping his nails or cleaning his teeth the first few weeks of his TPLO recovery if doing so will cause him to resist you. Sharp movements can interfere with the healing process, and if he’s already in pain, he might respond more aggressively than he would otherwise. Dogs get bored! They don’t get to catch up on reading or play their favorite Xbox games while they’re recuperating from surgery. Just like kids, they need to burn off that unexpended energy. Provide your dog with his favorite chew toys, and introduce some new ones to keep him busy while he’s on exercise restriction. Chew toys have the added benefit of distracting dogs from their wound sites. If your dog tends to pull at the leash, his recovery period might be an excellent time to work on his obedience skills. Use positive reinforcement techniques to keep him focused on you—not the squirrels—while you’re out on your walks. Don’t make him respond to repetitive sit and lay down commands, though, until your veterinarian has given him the green light. The TPLO Recovery Period: It’s Worth the Wait! Now that you know what to expect after TPLO surgery, you’re better prepared to help your dog through the process of TPLO recovery. The healing timeline and care precautions might seem daunting, but once again, they’re common practice for any patient needing post-operative care, whether she’s a human recovering from ACL repair or a dog bouncing from TPLO surgery. Except for the part about the chew toys. But positive reinforcement? That works for everyone! 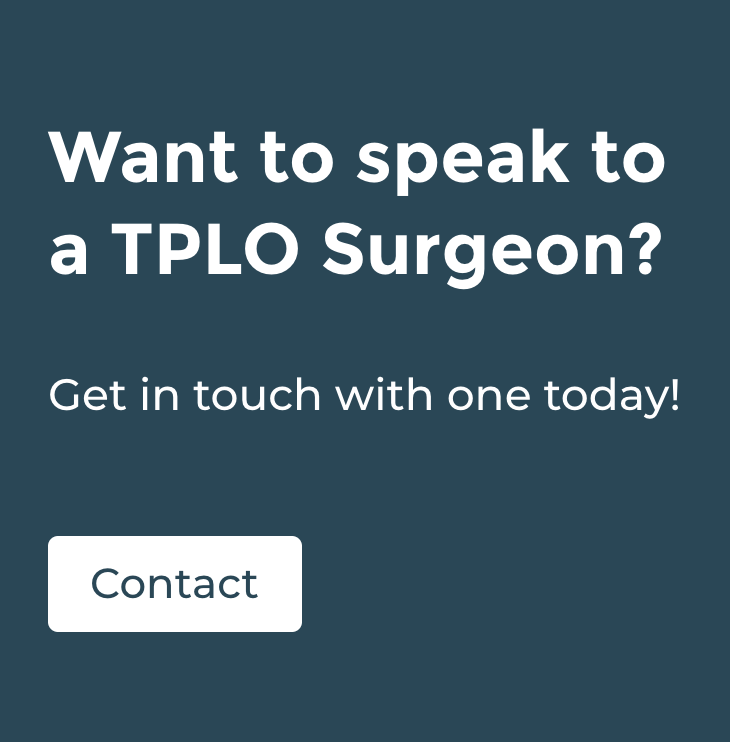 If you have questions about any of this please contact your TPLO Surgeon.